The Dallas Museum of Art has over 24,000 works of art from around the world and throughout time, spanning 5,000 years of human creativity. It's a big Museum, so start your visit with a gallery guide. Download the PDFs below and print at home, or pick one up in the Center for Creative Connections (C3). Please note, some Museum programs take place in the galleries. If your group plans to visit a gallery space where a public program is scheduled or underway, we ask that your group please return to that gallery after the program is over. Do you want to schedule a self-guided visit for your school group? Visit our Student Visits page. Just as Yayoi Kusama’s seemingly endless pumpkins in the installation All the Eternal Love I Have for the Pumpkins remind us of Halloween, several works in the DMA’s collection give off a mysterious vibe. Explore a few eerie, spine-chilling works with this Spooky Sightings tour! It’s a challenge to see everything in this Museum, so let’s play favorites! 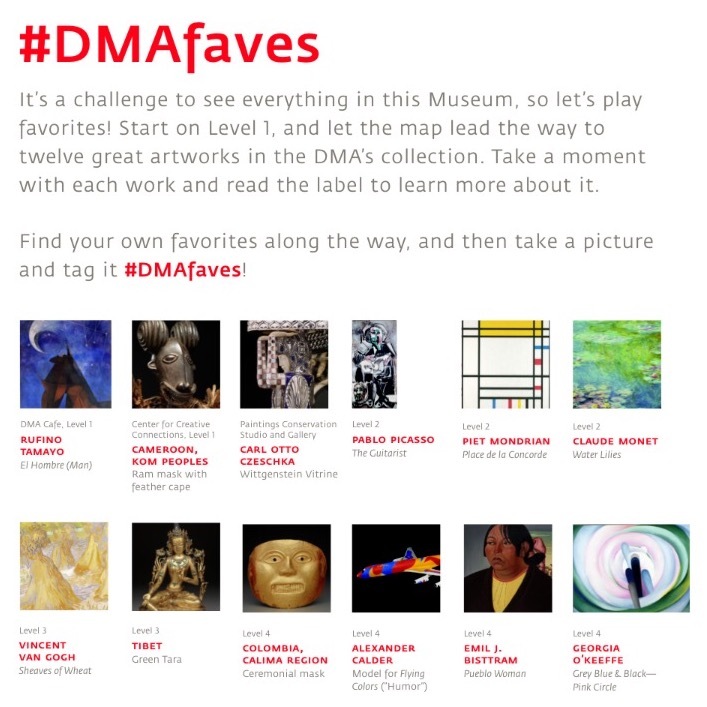 Start on Level 1, and let the map lead the way to twelve great artworks in the DMA’s collection. Take a moment with each work and read the label to learn more about it. Often representations of the Buddha or bodhisattvas—a person on the path toward enlightenment and becoming a Buddha—express specific hand gestures, called mudras. These gestures symbolize various meanings. Use this guide to explore various mudras and their meanings. Follow this guide to the ten DMA artworks featured in Art Everywhere US. Brush up on your American history along the way. Do you crave blue skies, chirping birds, and blades of grass beneath your feet? Use this Park Rangers guide to explore nature inside the DMA. Beauty is a universally complex concept. Personal ideas, cultural beliefs, and more inform our thoughts about beauty. What makes someone beautiful? Indonesia spans more than 17,000 islands and lies over 9,000 miles away from Dallas, Texas. The DMA has one of the world’s most acclaimed collections of Indonesian art. Explore the galleries on Level 3 to gather insights about the diverse peoples who live and have lived in Indonesia. Are you seeing red? You will be! Explore the galleries on Level 4 to see the many ways that artists have used the color red. The DMA has thousands of gilded, golden, and glittering works of art. We've gathered five that will take you across the world and the centuries to discover that all that glitters is really gold (or silver!). Feeling INCREDIBLE, SUPER, or MARVELous? This guide is for all aspiring superheroes, young and old. So grab your cape and trusty sidekick as we explore some of the superheroes in the collections. A tribute to Dr. King, this gallery guide features works of art in the DMA’s collection that resonate with the spirit of peace, hope, faith, and determination prevalent throughout King’s actions and teachings.